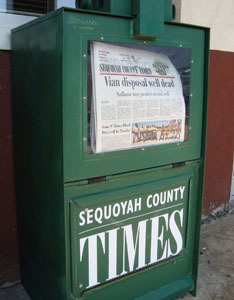 To hear the story of the Sequoyah County Times, click the images below. 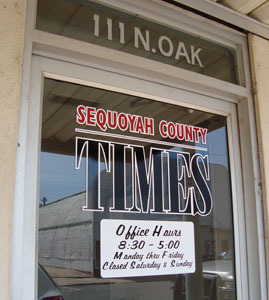 The Seqouyah County Times is located in a former movie theater building at 111 N. Oak St., Sallisaw, Okla. 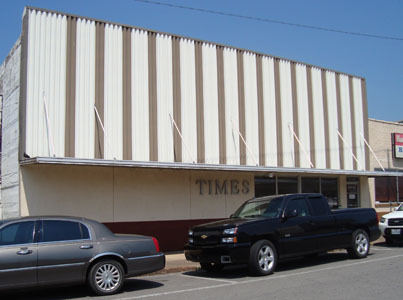 The Sequoyah County Times is a twice weekly, 5,000-circulation, family-owned newspaper in Sallisaw, Okla. (pop. 8,000). Wheeler and Florence Mayo founded the Times in 1932, but through mergers they traced the paper's roots back to 1893. 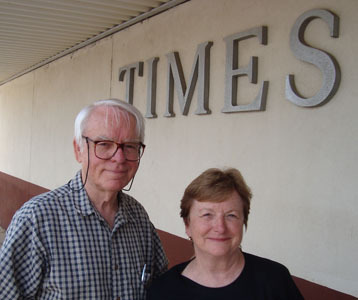 Today the Times is managed by their son, Jim Mayo, publisher, and the founder's grandson, Jeff Mayo, associate publisher and general manager. Jim Mayo is a throat cancer survivor and was joined in the management of the paper by his son, Jeff, an attorney, in 2003. 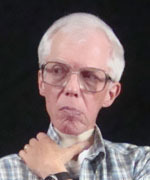 Since returning to Sallisaw, Jeff Mayo was honored in 2010 by the National Newspaper Association for his outstanding leadership in community journalism. While circulation has increased slightly the last several years, the Times' advertising revenues have declined. As a cost-saving measure, the Times sold its presses, and they now out-source the printing of the newspaper. The owners consider this one of the best changes they have made to reduce overhead in recent years. The Times has a lively website, and while the management anticipates its growing importance, the owners believe their print product will be the company's dominant source of revenue for the foreseeable future. 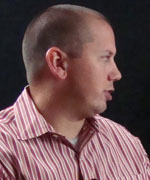 Jeff Mayo manages the day-to-day operation of the website and out-sources the technical elements. They have experimented with using video on the site, but have found that few readers watch it. In addition to a small, full-time staff, the Times relies heavily on local stringer/columnists to report local news other regional news sources don't cover. An example is the Times' Sunday "Just Folks" section, which thoroughly records local weddings, births, obituaries, and community events. 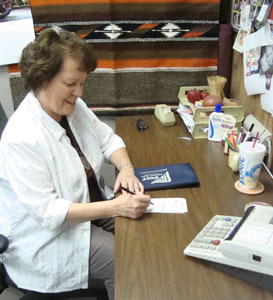 In thousands of smaller U.S. communities, weekly and semi-weekly newspapers, like the Times, publish with small staffs. These newspapers serve a critical function, documenting hometown events and providing a platform for local merchants to establish their businesses. In the words of Times publisher, Jim Mayo, the Times is "the glue that holds the community together." In this report, Jim and Jeff Mayo are interviewed together -- Jeff provides translation for his father's comments. Jim provides a rich recounting of values and practices in small town newspapers in the 20th century, and Jeff outlines the strategies the Times is using to increase revenue. 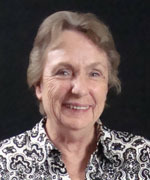 Sally Maxwell, managing editor, explains her no-nonsense approach to journalism: "Write! Write! Write! ... [and] ... tell the truth!" More background data on the newspaper's revenue and activities is available in the Backgrounder PDF attached to this report. URLs for several enterprise reports have also been added that show off Time's reporting. And, we've included PDF files of a special report, produced by the Times in 2006, that explore the impact of a proposed coal plant in Sequoyah County.